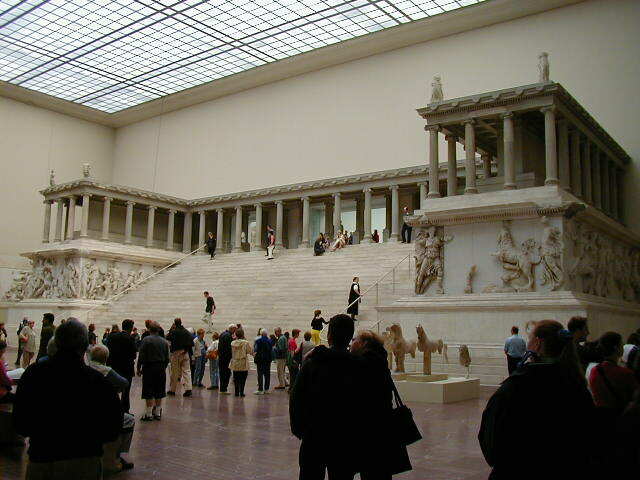 Remember the Pergamon Museum in Berlin? After seeing the museum exhibit I wanted to see the remains of the city itself. 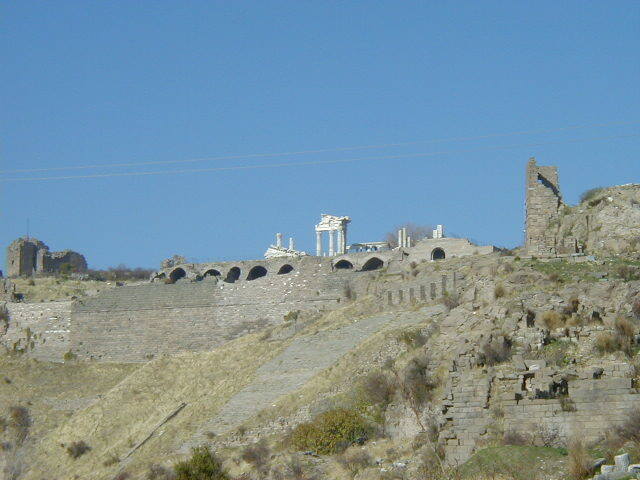 Ancient Pergamon was on a hill that has been settled since the 6th century B.C. 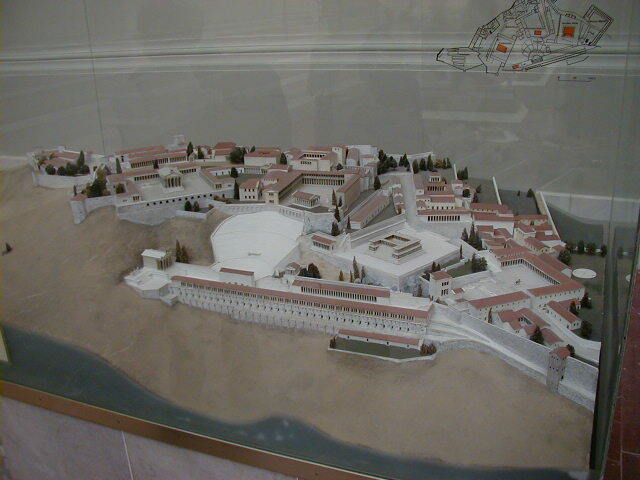 The city was the center of a small but wealthy kingdom. 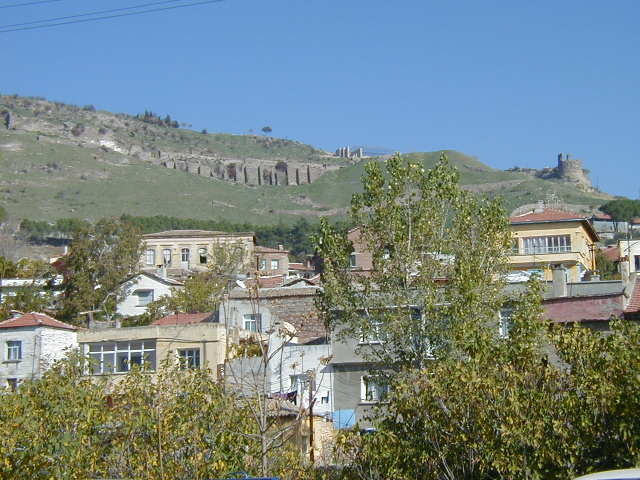 Modern Bergama is an unimpressive town at the base of Pergamon hill. My bus arrived at 8:30 in the morning and I got a room in Athena Pension for $10, and slept until early afternoon. 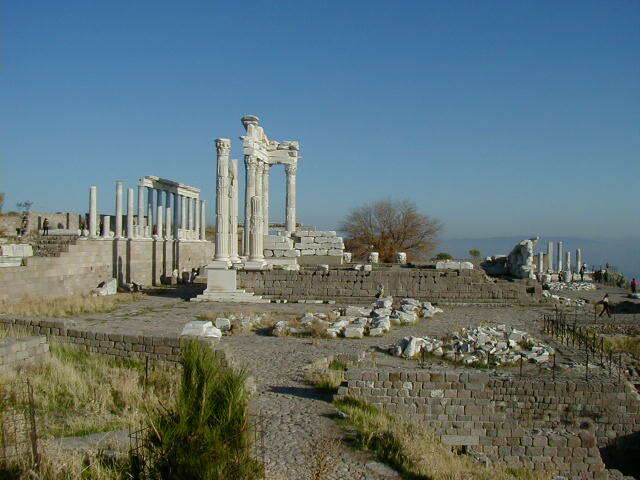 After waking I went to see the Asclepion, named after Asclepius, the Greek God of Medicine. 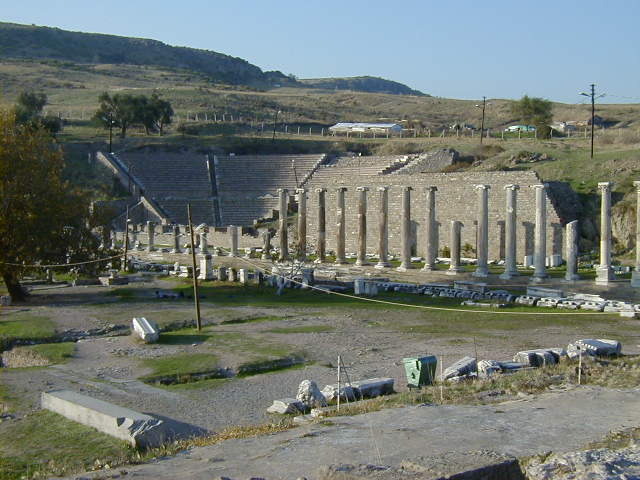 In the fourth century B.C., after conquering the area, Alexander the Great founded the Asclepion, a once famous healing center, with pools, a treatment center linked to the pools by tunnel, and a theater. 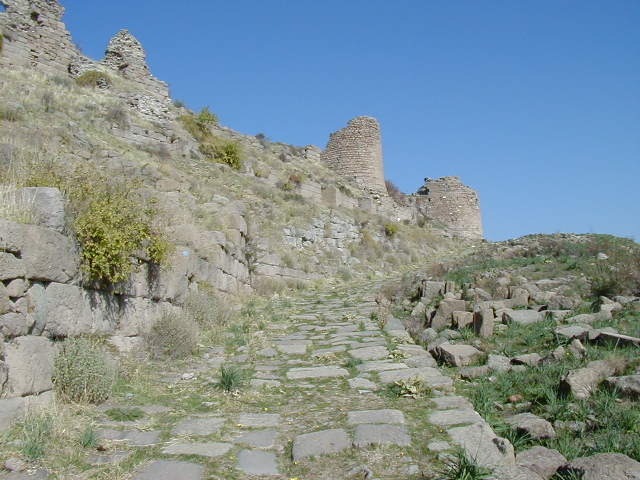 Under Roman rule a road was built connecting the Asclepion to Pergamon. 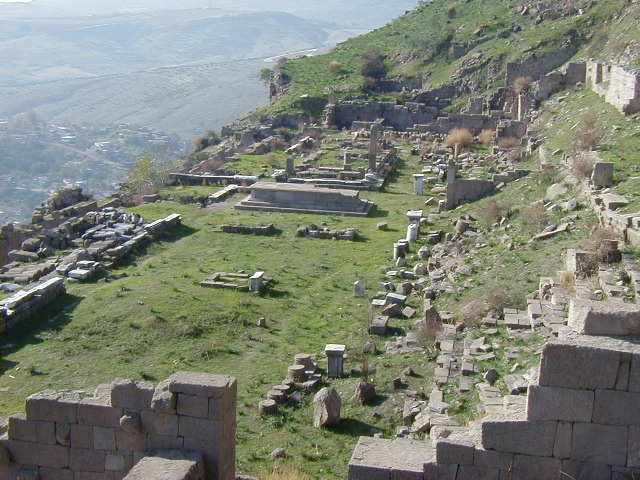 At its peak Pergamon reached a population of 150,000. 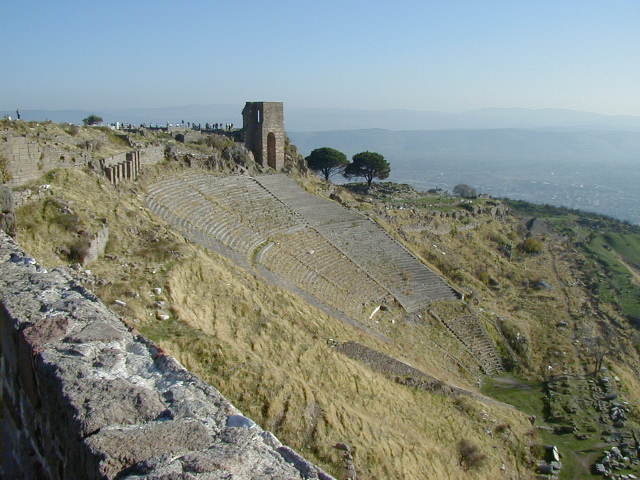 The city center was on Pergamon hill, with the most important buildings on the top of the hill and houses and lesser buildings covering the sides and the surrounding land. 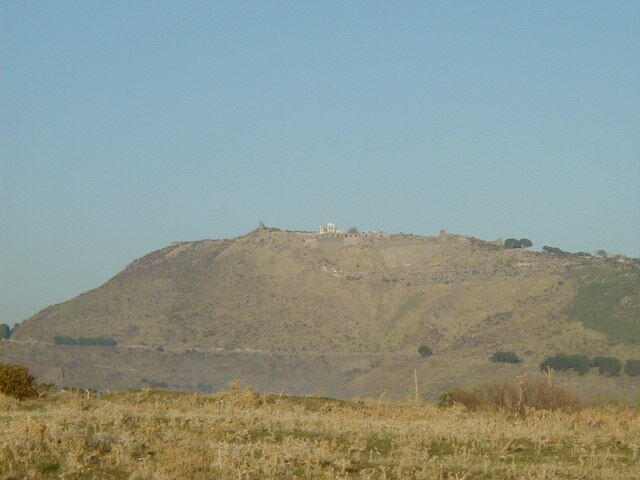 Two thousand years ago this hill was covered with marble temples and buildings. Time and looting has taken a heavy toll. 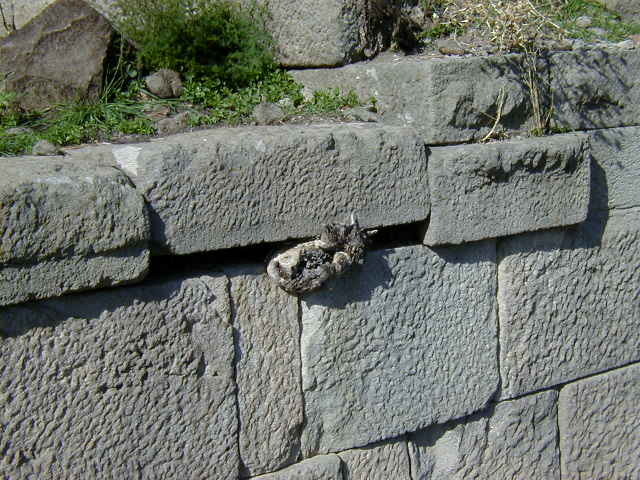 Archaeologists carting off choice pieces robbed it of its finest remains, but at least what they took was preserved. Before the archaeologists arrived locals were breaking up the marble and burning it to make lime. Irreplaceable treasures reduced to a very cheap chemical. 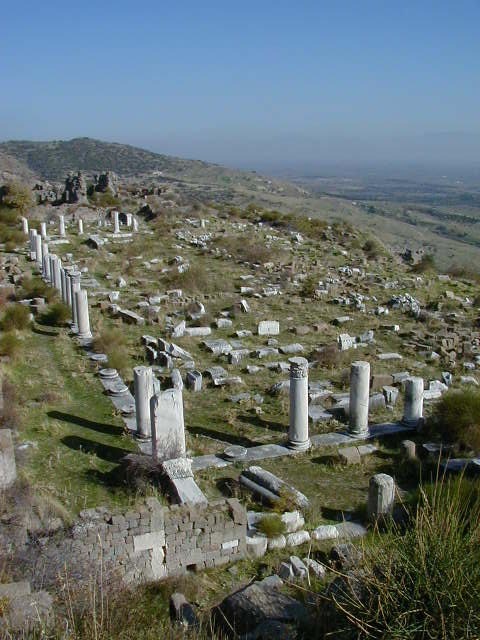 Now Pergamon is a large, dusty hill covered with roads, foundations and walls; but very little remains of the beautiful marble buildings and statues. 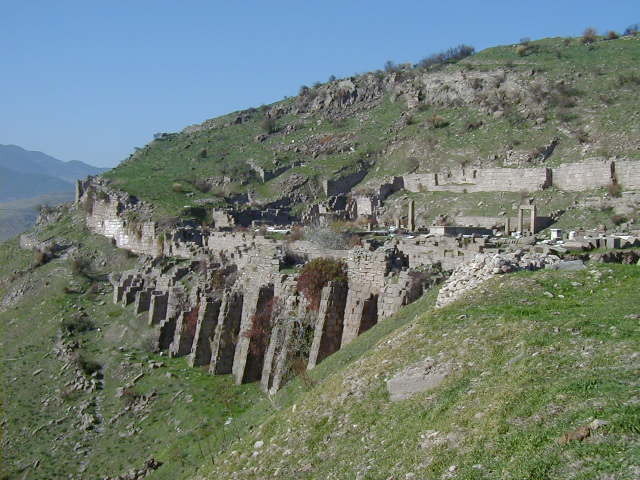 I hiked up the hill into the ruins the next day. 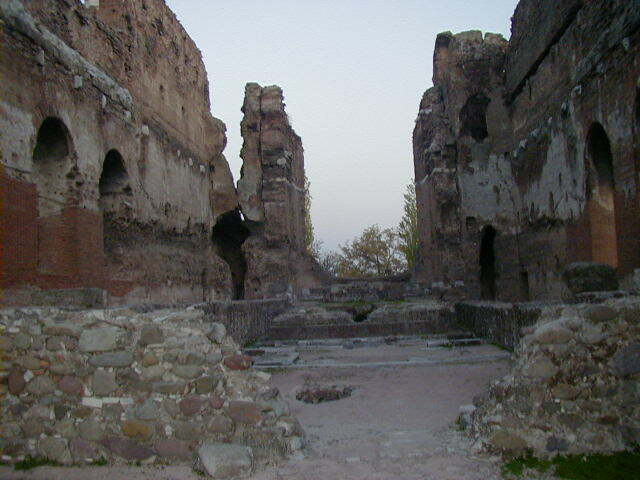 Very little of the city has been restored, but some of it is still standing. The old road still is usable. 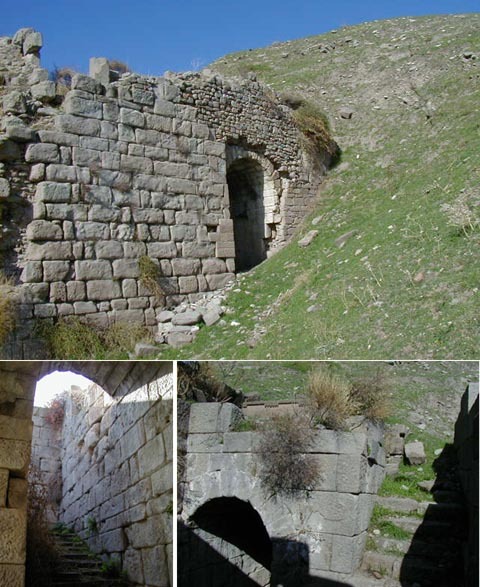 Wandering around nearly deserted ruins without any roped off areas or "Keep Off" signs is fun. 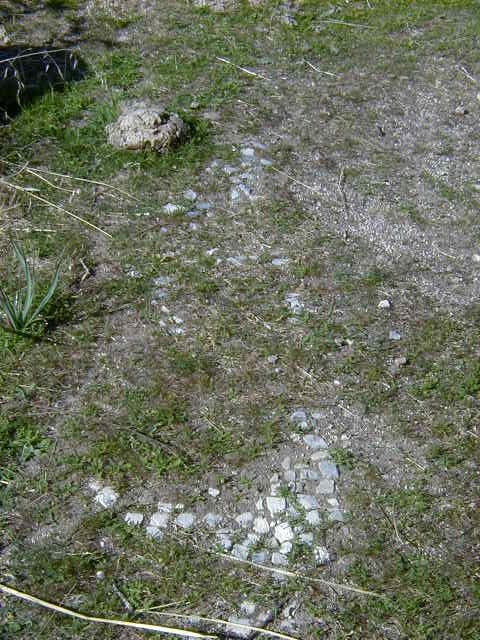 I was walking by the remains of one building, looked down and realized I was standing on the remains of a mosaic floor. I also passed flower eating turtles (I kept my distance, they looked vicious) and a cow wearing nice jewelry. There must be a story there, but I have no idea what it is. The following pictures were taken higher up. 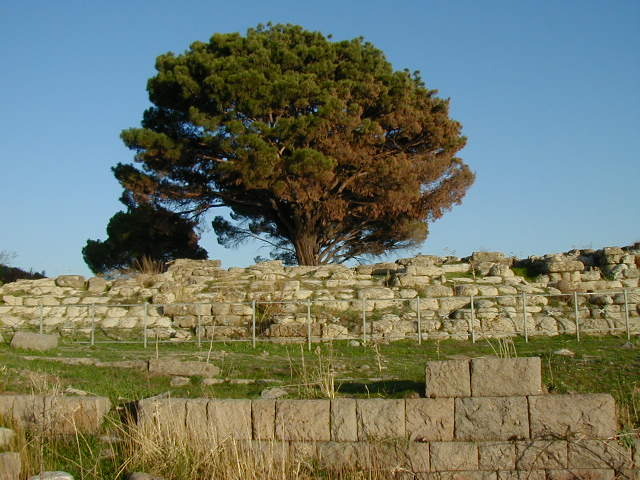 I think the first one is the remains of the Sanctuary of Hera, followed by a shot of the city wall and Sanctuary of Demeter. 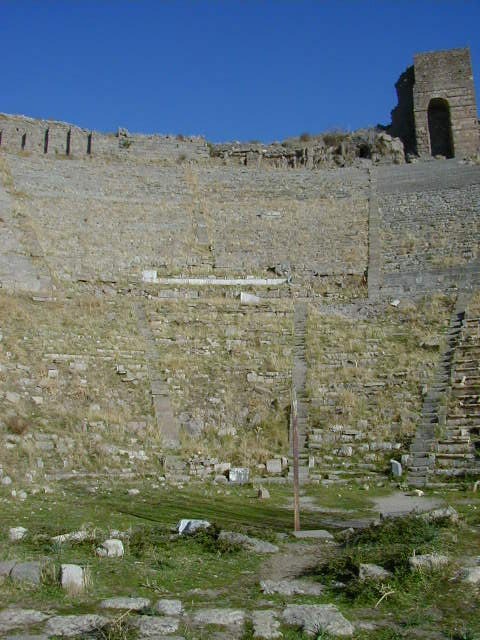 After that are some pieces of the jigsaw puzzle archaeologists face when reconstructing a city, another view of the Sanctuary of Demeter, building remnants, and a small gymnasium. 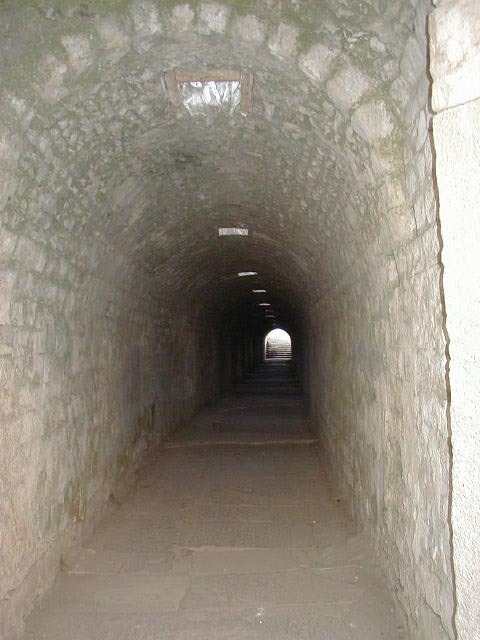 I veered off the main trail to go to the top of the hill by way of the amphitheater. 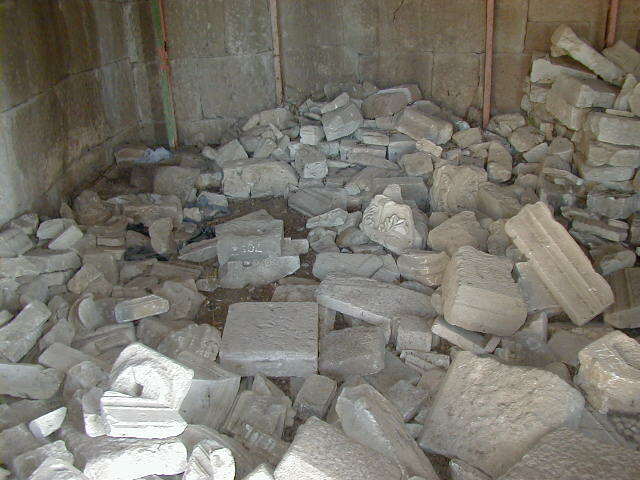 On top is the partial reconstruction of the Trajan Temple. 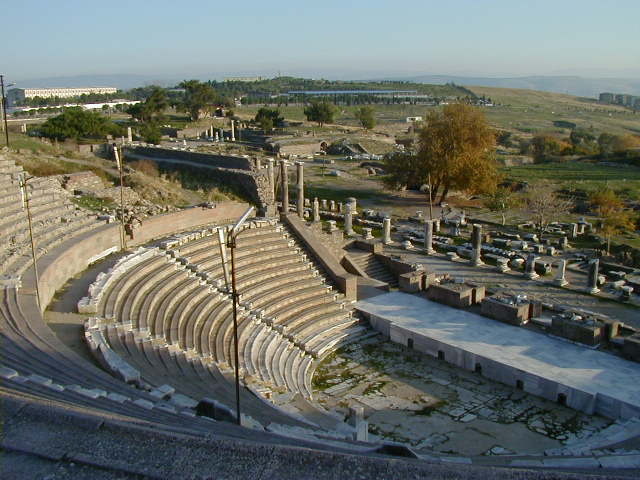 It's a pity so much marble has been carted off; if just the top of the hill could be reconstructed it would be an amazing place. 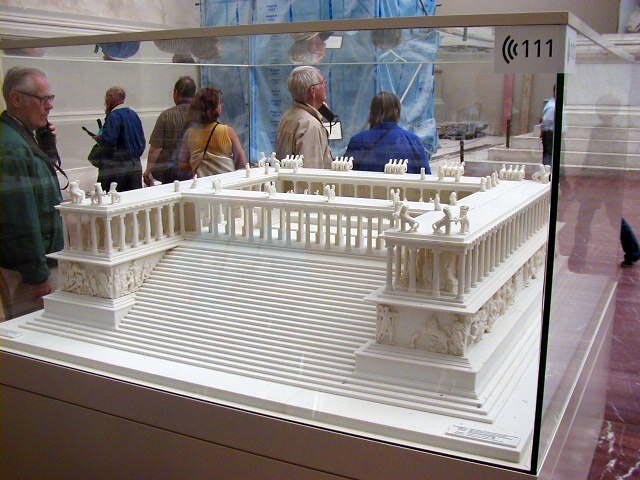 At the top of the page is a picture of the Temple of Zeus reconstructed in the Pergamon Museum in Berlin. On the way down I passed what had been the Temple of Zeus. All that remains is the foundation, with a large old tree growing in the center. 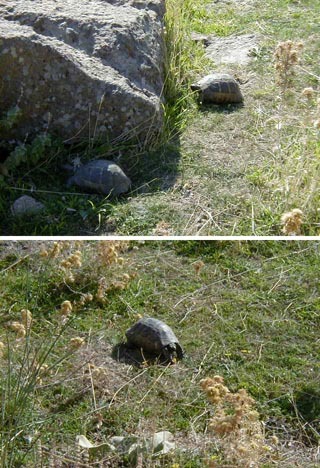 Sad, but kind of cool. 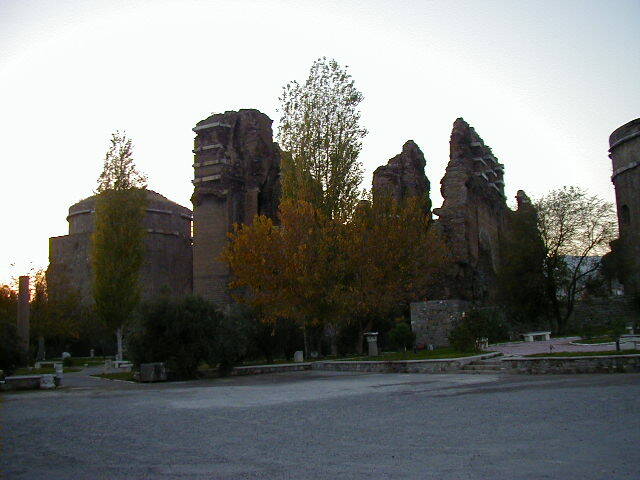 Walking back to Bergama I passed the Red Palace. 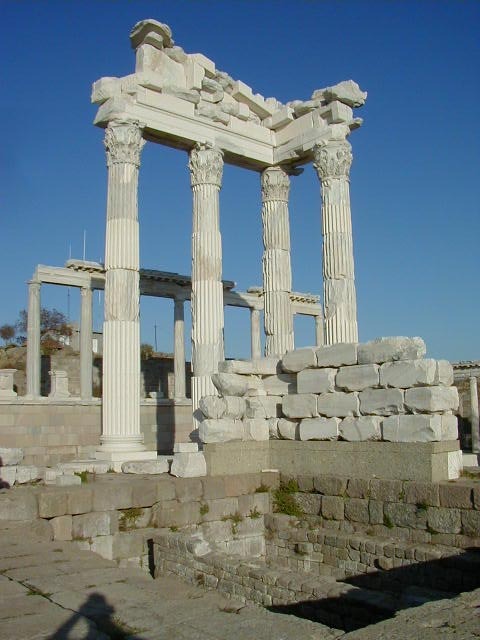 In the second century A.D. it was the largest temple in Roman times, covering an area of 100 by 260 meters. 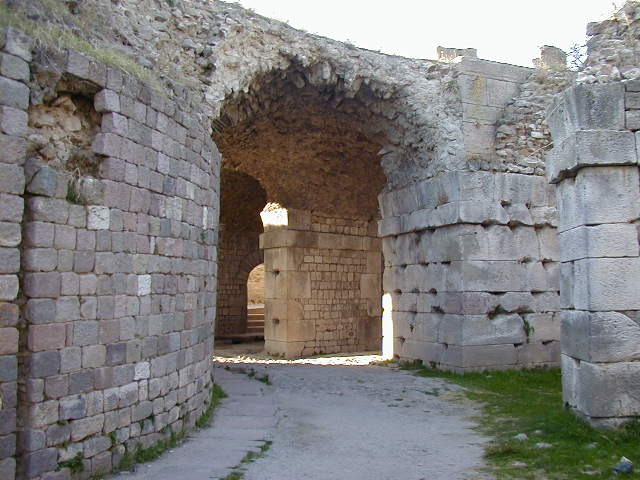 It was originally a temple built to Egyptian gods. 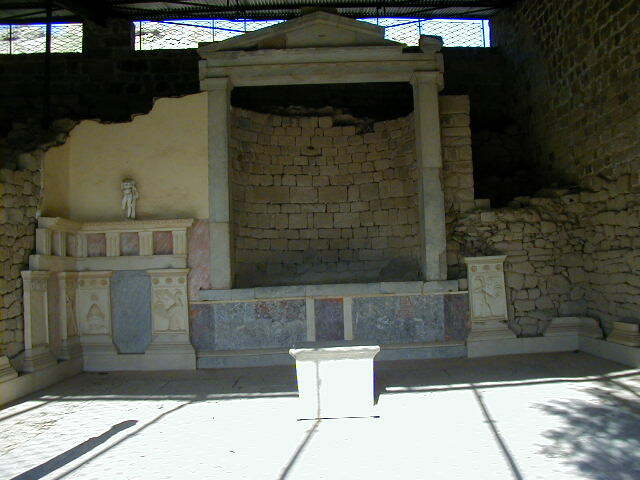 In Greek and Roman times "that old time religion" meant Egypt. In the center was a hollow statue with a secret entrance underneath, used to awe the faithful by presenting a "talking" god. 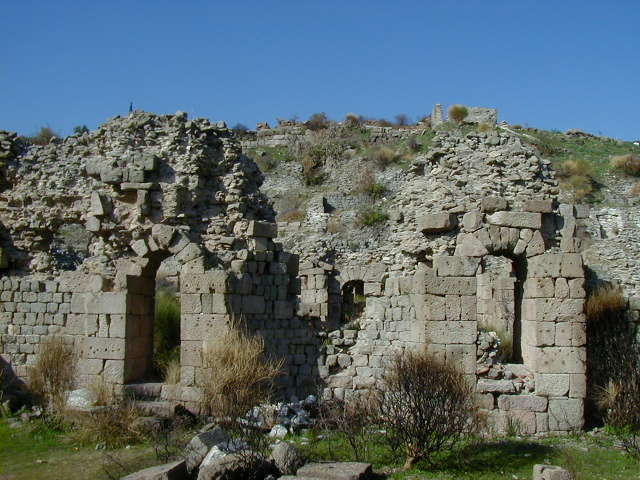 The temple was converted to a church in Byzantine times. I don't know if they continued using the talking statue trick. 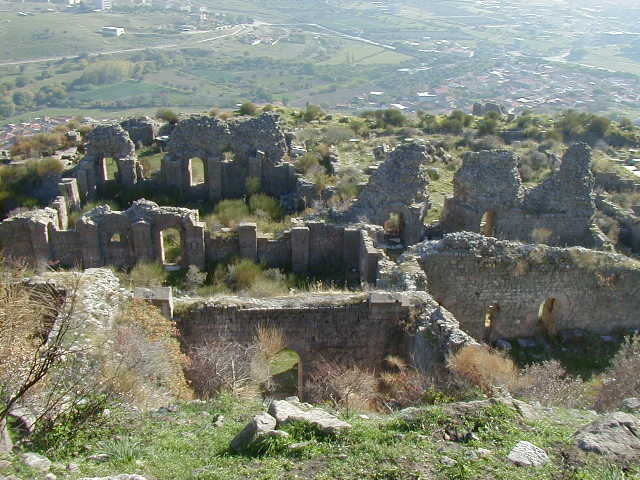 I enjoyed my day hiking around Pergamon hill, but there was no reason to remain in Bergama afterwards. It's not a real happening town. 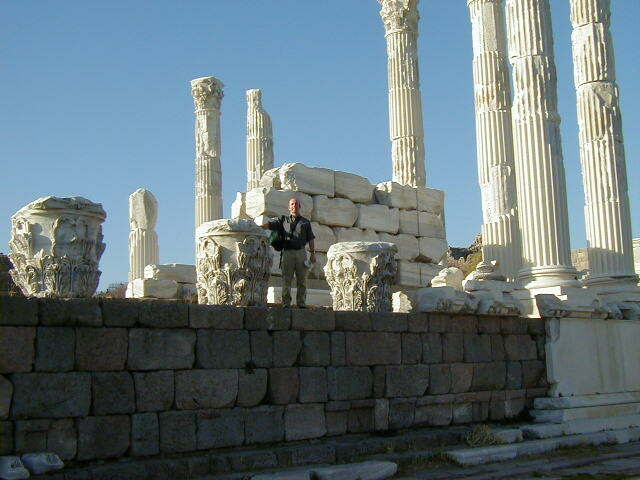 The next morning I caught the bus to Selcuk.